Don’t hate him for doing his homework! 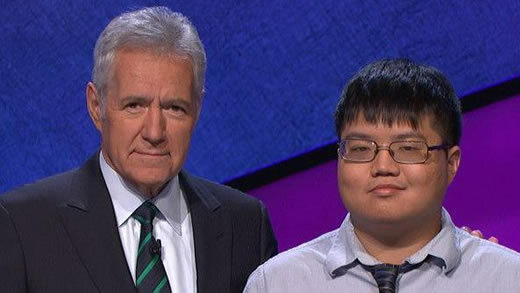 Arthur Chu is a Jeopardy contestant, who’s been having a very good run lately. After 4 winning nights on the show, his current cash winnings stand at more than $111,000. But Arthur’s very specific game strategy – jumping across the board in search of the ‘Daily Doubles’, and going for the tie in ‘Final Jeopardy’ – has drawn a lot of anger from some sections of the public. He’s been copping heaps of abuse and accusations of cheating and immoral behaviour. It seems to me that all Arthur’s done is that he’s developed a strategy for playing the game, and he’s now using that strategy. That’s exactly what I did with Temptation, that’s exactly what Martin Flood did with Millionaire. Loads of game show winners have studied the game shows they’re going on, prior to going on them. In fact, I think you’re silly if you don’t. Particularly now, when the information is so plentiful and accessible. There are countless videos, forums and websites (like this one!) that can give you all sorts of tips and hints, and of course you can bet that video clips of whatever show you’re interested in going on will be very easy to find online. I don’t quite understand why anyone would have a problem with Arthur preparing for his appearance, devising a strategy, and then using that strategy – it’s all within the rules of the game, he’s done smart preparation and now it’s working for him. He’s gathered as much information about the game and the show as he can before going on, and he’s using that information! Information which is available to everybody, by the way. An Arthur’s not apologising. Why should he? This entry was posted in 'Jeopardy', Brain Training, Game Show Winners, Interviews, Strategy, Tactics, Updates by Stephen. Bookmark the permalink.